Casas Do Moinho is ideally situated in a natural park, close to several beaches. It offers 5-star accommodation with free WiFi in ts common areas and includes an outdoor swimming pool with panoramic views. 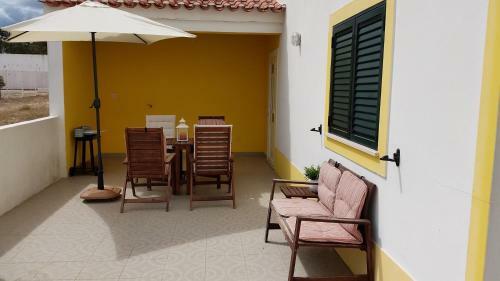 Casa dos Malhadais is a detached holiday home with a terrace, set in Odeceixe. The unit is 37 km from Lagos. Free private parking is available on site. Featuring free WiFi throughout the property, Casa Morais offers accommodation in Odeceixe, 38 km from Lagos. A terrace or balcony are featured in certain rooms. All rooms are equipped with a private bathroom fitted with a bath. Located in Odeceixe, this apartment features free WiFi and a terrace. The property boasts views of the mountains is 38 km from Lagos. There is a dining area and a kitchen equipped with dishwasher. A flat-screen TV is offered. Surrounded by cork trees and pine groves, Casa Vicentina is a family-run hotel full of character, built using ecological materials. Set within a natural park, it’s 3 km from Odeceixe Beach.